In the "First come first serve" scheduling algorithm, as the name suggests, the process which arrives first, gets executed first, or we can say that the process which requests the CPU first, gets the CPU allocated first. First Come First Serve, is just like FIFO(First in First out) Queue data structure, where the data element which is added to the queue first, is the one who leaves the queue first. This is used in Batch Systems. It's easy to understand and implement programmatically, using a Queue data structure, where a new process enters through the tail of the queue, and the scheduler selects process from the head of the queue. A perfect real life example of FCFS scheduling is buying tickets at ticket counter. For every scheduling algorithm, Average waiting time is a crucial parameter to judge it's performance. 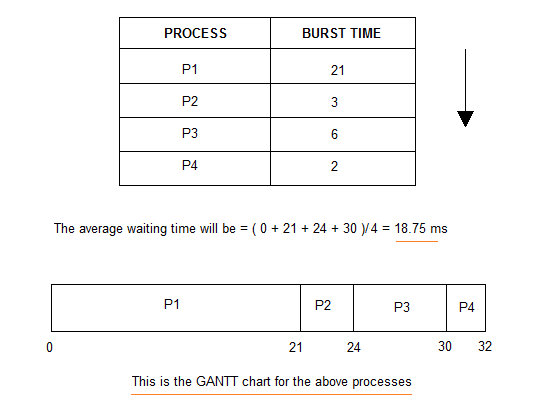 AWT or Average waiting time is the average of the waiting times of the processes in the queue, waiting for the scheduler to pick them for execution. Lower the Average Waiting Time, better the scheduling algorithm. Consider the processes P1, P2, P3, P4 given in the below table, arrives for execution in the same order, with Arrival Time 0, and given Burst Time, let's find the average waiting time using the FCFS scheduling algorithm. Similarly, waiting time for process P3 will be execution time of P1 + execution time for P2, which will be (21 + 3) ms = 24 ms.
For process P4 it will be the sum of execution times of P1, P2 and P3. The GANTT chart above perfectly represents the waiting time for each process. It is Non Pre-emptive algorithm, which means the process priority doesn't matter. If a process with very least priority is being executed, more like daily routine backup process, which takes more time, and all of a sudden some other high priority process arrives, like interrupt to avoid system crash, the high priority process will have to wait, and hence in this case, the system will crash, just because of improper process scheduling. Not optimal Average Waiting Time. Resources utilization in parallel is not possible, which leads to Convoy Effect, and hence poor resource(CPU, I/O etc) utilization. Convoy Effect is a situation where many processes, who need to use a resource for short time are blocked by one process holding that resource for a long time. This essentially leads to poort utilization of resources and hence poor performance. Here we have a simple C++ program for processes with arrival time as 0. In the program, we will be calculating the Average waiting time and Average turn around time for a given array of Burst times for the list of processes. Completion Time: Time taken for the execution to complete, starting from arrival time. Turn Around Time: Time taken to complete after arrival. In simple words, it is the difference between the Completion time and the Arrival time. Waiting Time: Total time the process has to wait before it's execution begins. It is the difference between the Turn Around time and the Burst time of the process. For the program above, we have considered the arrival time to be 0 for all the processes, try to implement a program with variable arrival times.